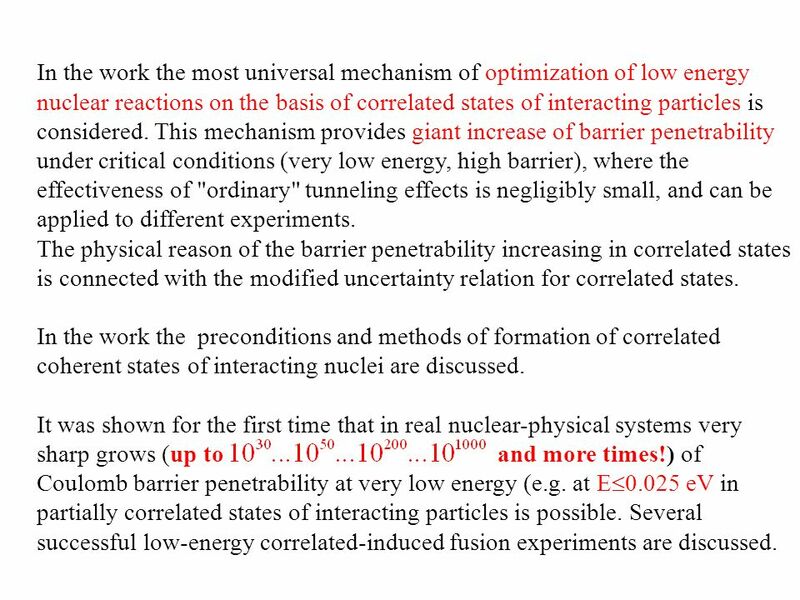 2 In the work the most universal mechanism of optimization of low energy nuclear reactions on the basis of correlated states of interacting particles is considered. This mechanism provides giant increase of barrier penetrability under critical conditions (very low energy, high barrier), where the effectiveness of "ordinary" tunneling effects is negligibly small, and can be applied to different experiments. 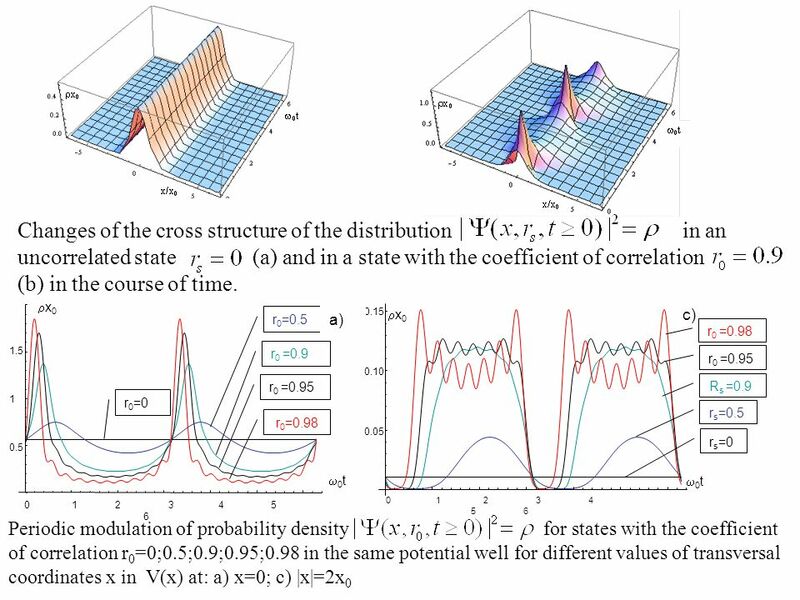 The physical reason of the barrier penetrability increasing in correlated states is connected with the modified uncertainty relation for correlated states. 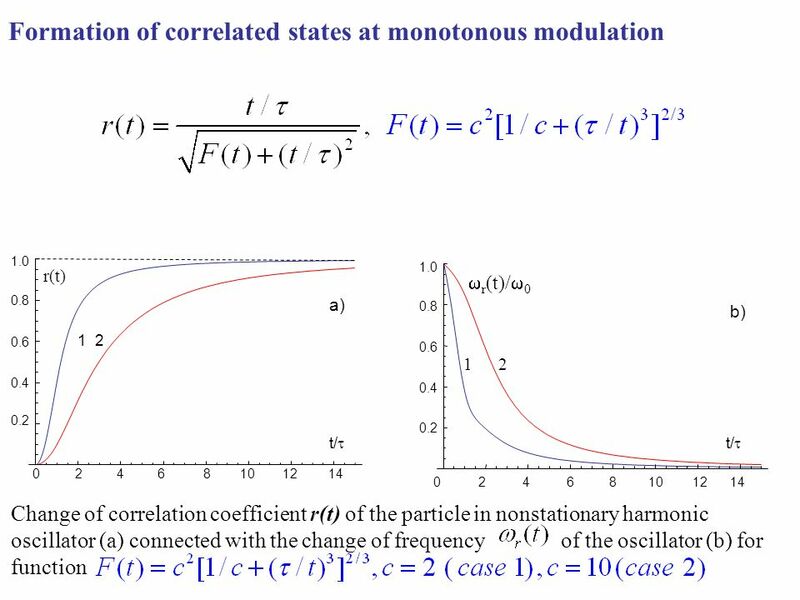 In the work the preconditions and methods of formation of correlated coherent states of interacting nuclei are discussed. It was shown for the first time that in real nuclear-physical systems very sharp grows (up to and more times!) 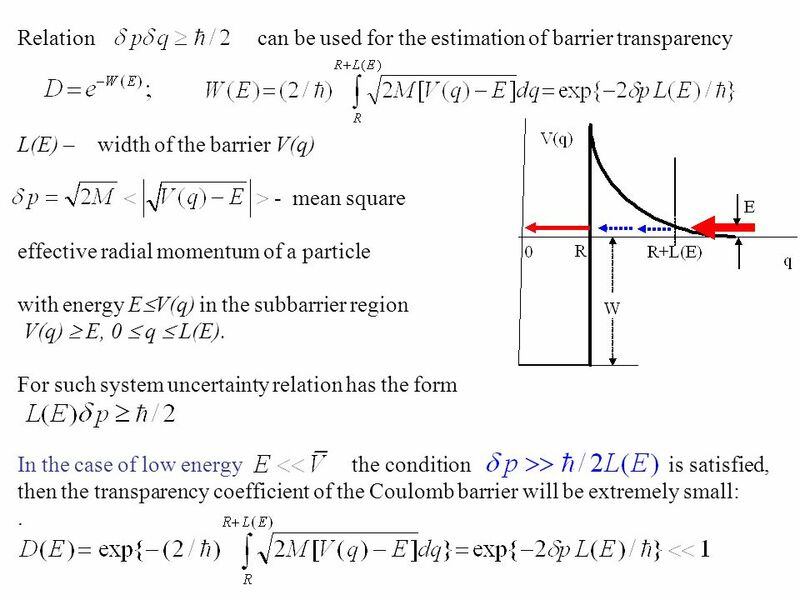 of Coulomb barrier penetrability at very low energy (e.g. 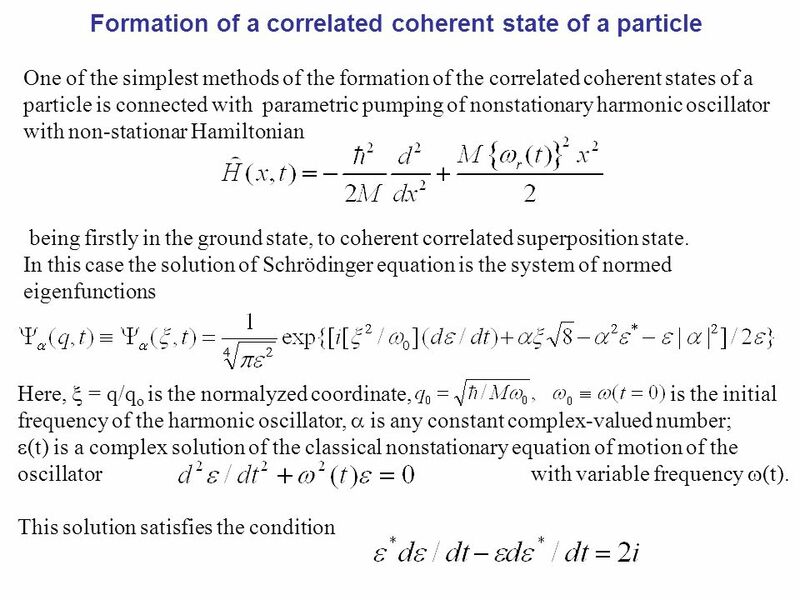 at E  0.025 eV in partially correlated states of interacting particles is possible. Several successful low-energy correlated-induced fusion experiments are discussed. 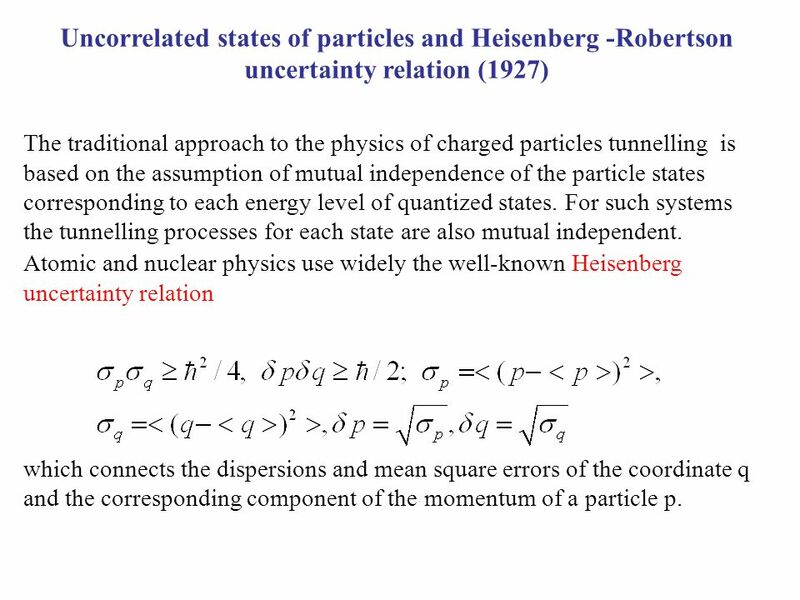 3 Uncorrelated states of particles and Heisenberg -Robertson uncertainty relation (1927) The traditional approach to the physics of charged particles tunnelling is based on the assumption of mutual independence of the particle states corresponding to each energy level of quantized states. For such systems the tunnelling processes for each state are also mutual independent. 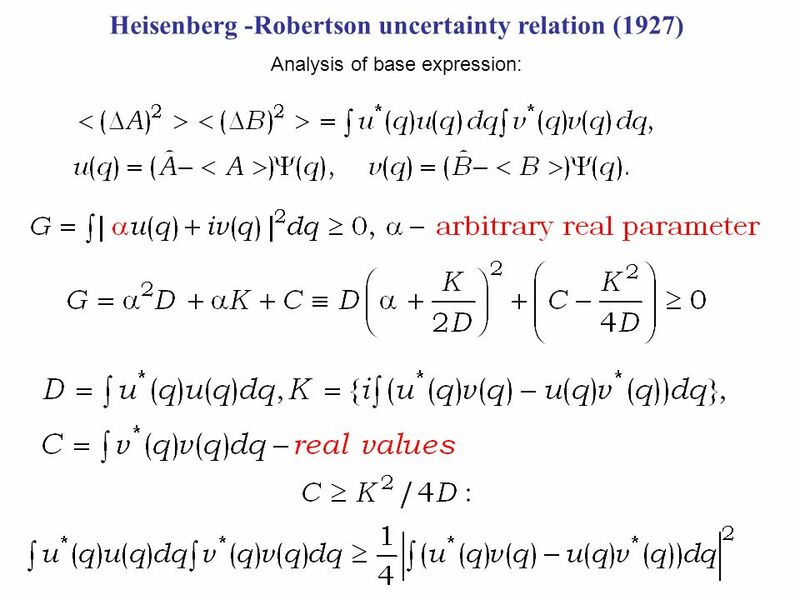 Atomic and nuclear physics use widely the well-known Heisenberg uncertainty relation which connects the dispersions and mean square errors of the coordinate q and the corresponding component of the momentum of a particle p.
4 Generalized uncertainty relation was discovered by Robertson in 1929 for mutual independent dynamical variables A and B, whose commutator is nonzero. 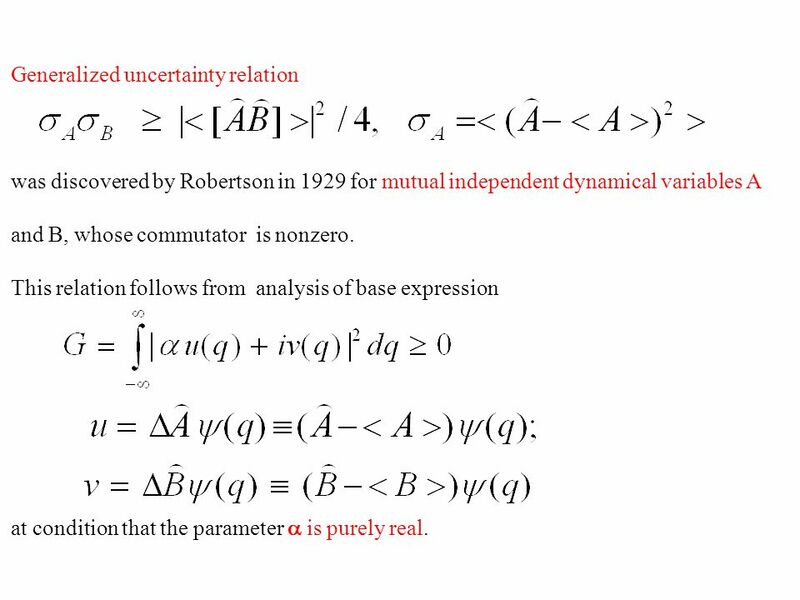 This relation follows from analysis of base expression at condition that the parameter  is purely real. 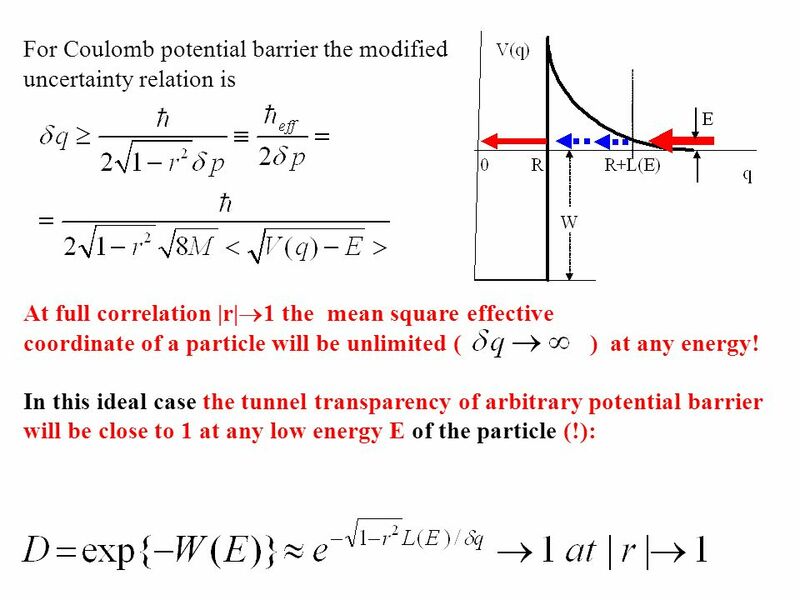 7 Relation can be used for the estimation of barrier transparency L(E) – width of the barrier V(q) - mean square effective radial momentum of a particle with energy E  V(q) in the subbarrier region V(q)  E, 0  q  L(E). 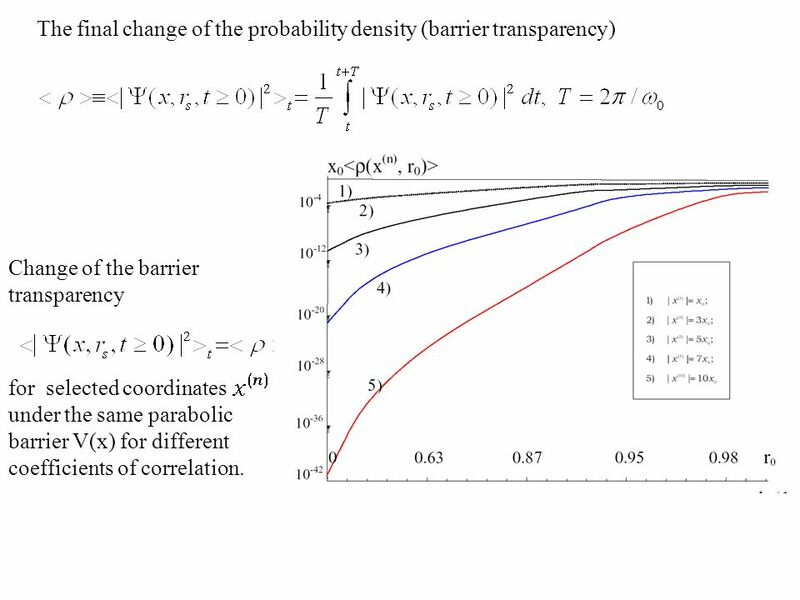 For such system uncertainty relation has the form In the case of low energy the condition is satisfied, then the transparency coefficient of the Coulomb barrier will be extremely small:. 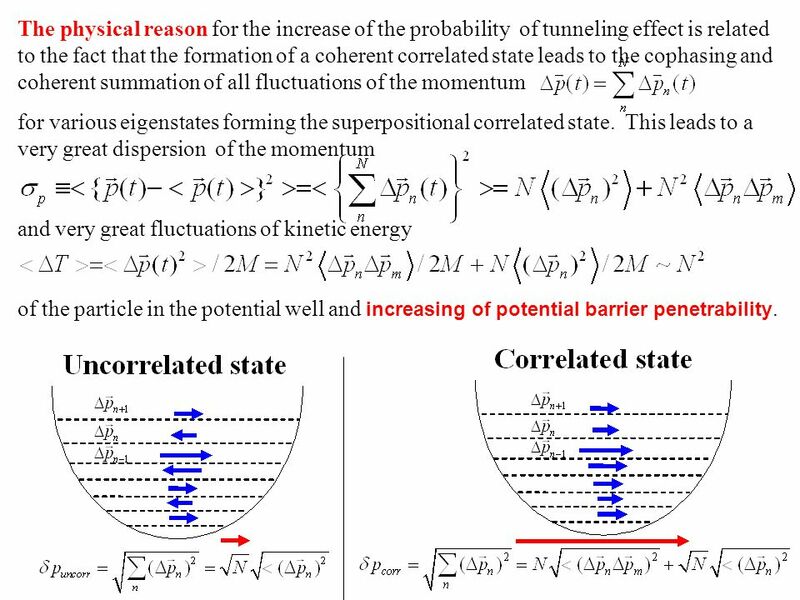 13 The physical reason for the increase of the probability of tunneling effect is related to the fact that the formation of a coherent correlated state leads to the cophasing and coherent summation of all fluctuations of the momentum for various eigenstates forming the superpositional correlated state. 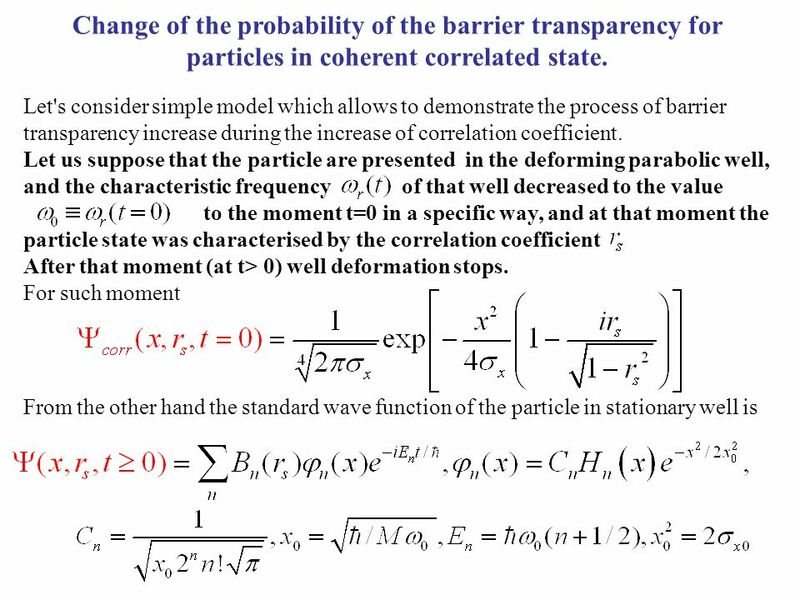 This leads to a very great dispersion of the momentum and very great fluctuations of kinetic energy of the particle in the potential well and increasing of potential barrier penetrability. 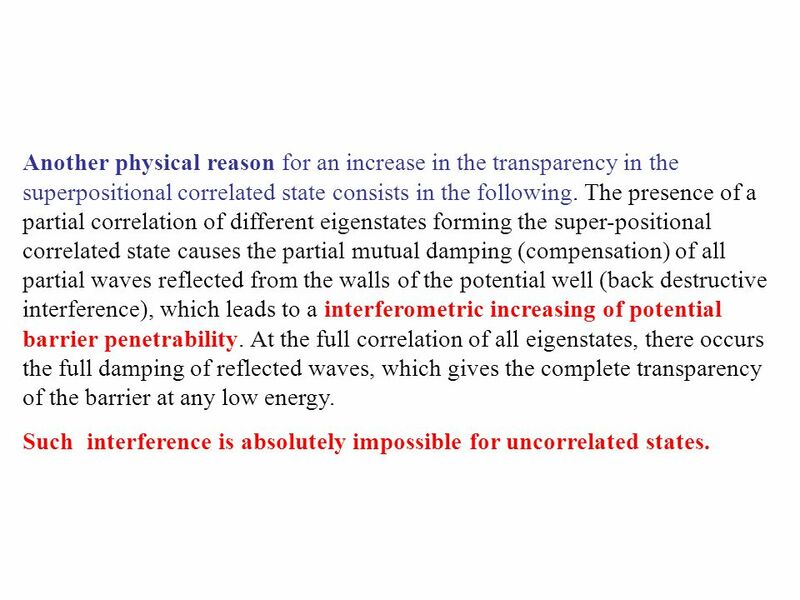 14 Another physical reason for an increase in the transparency in the superpositional correlated state consists in the following. 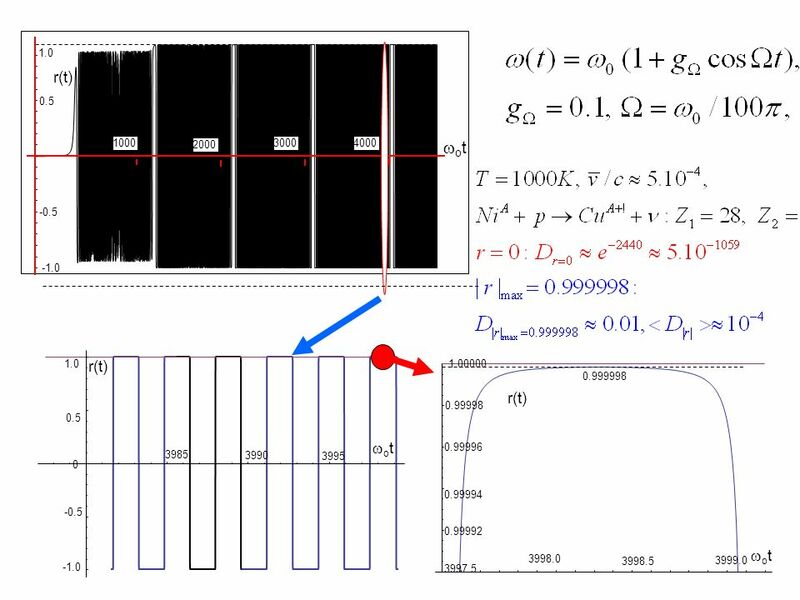 The presence of a partial correlation of different eigenstates forming the super-positional correlated state causes the partial mutual damping (compensation) of all partial waves reflected from the walls of the potential well (back destructive interference), which leads to a interferometric increasing of potential barrier penetrability. 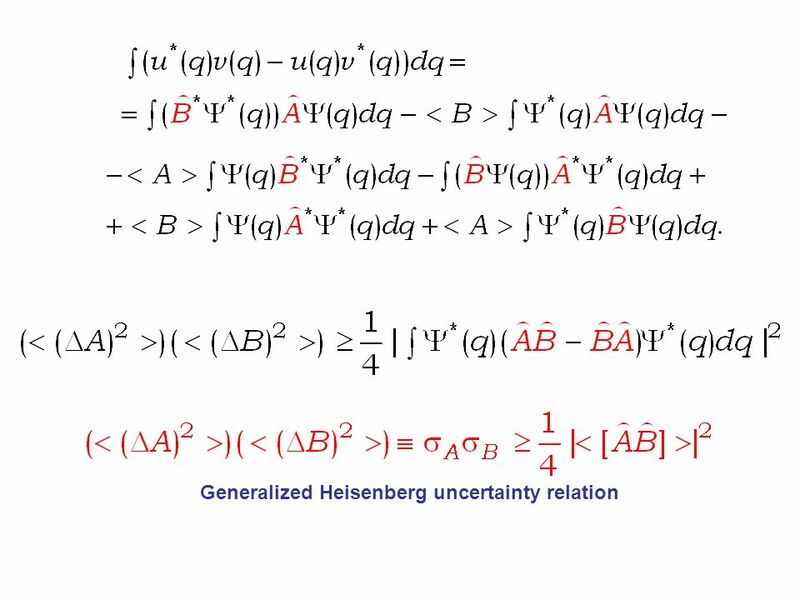 At the full correlation of all eigenstates, there occurs the full damping of reflected waves, which gives the complete transparency of the barrier at any low energy. 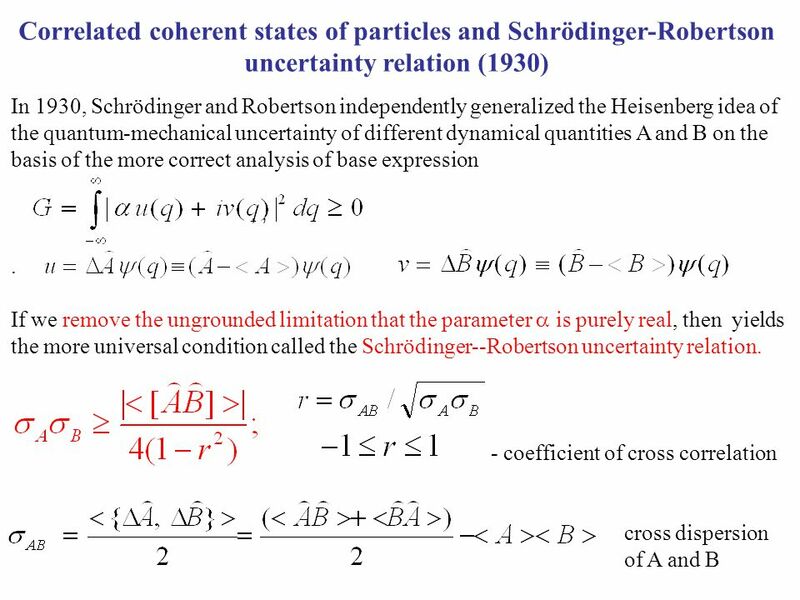 Such interference is absolutely impossible for uncorrelated states. 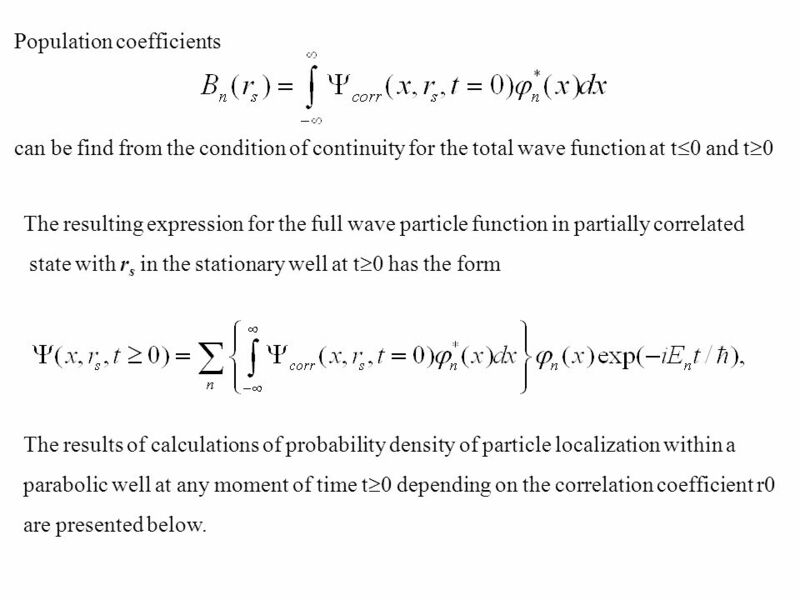 20 Population coefficients can be find from the condition of continuity for the total wave function at t  0 and t  0 The resulting expression for the full wave particle function in partially correlated state with r s in the stationary well at t  0 has the form The results of calculations of probability density of particle localization within a parabolic well at any moment of time t  0 depending on the correlation coefficient r0 are presented below. 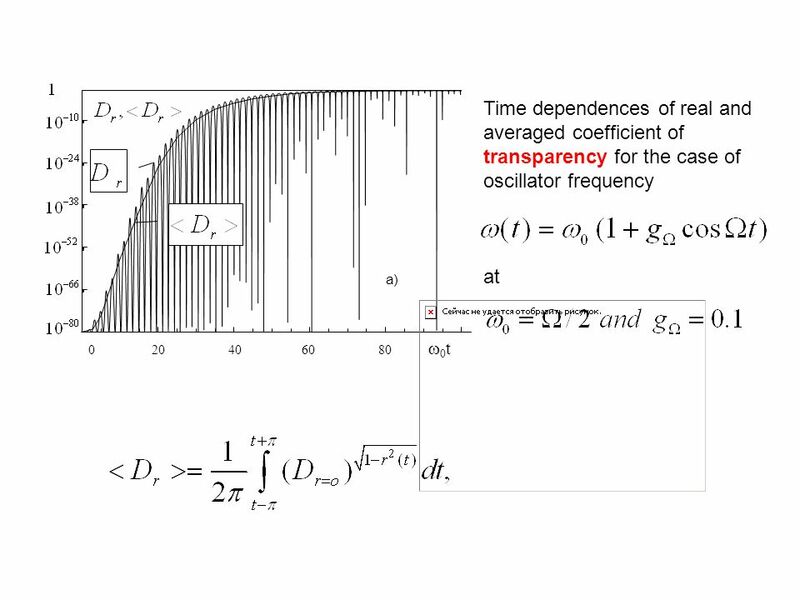 24 The very sharp grows (up to and more times) of the barrier transparency and the same grows of rate of nuclear synthesis (averaged probability of reaction per unit of time for one pair of interacting nuclei situated at ) for different distances under the barrier with increasing of the coefficient of correlation is related to the Schrödinger—Robertson modified relation of uncertainty and is the direct result of this relation. 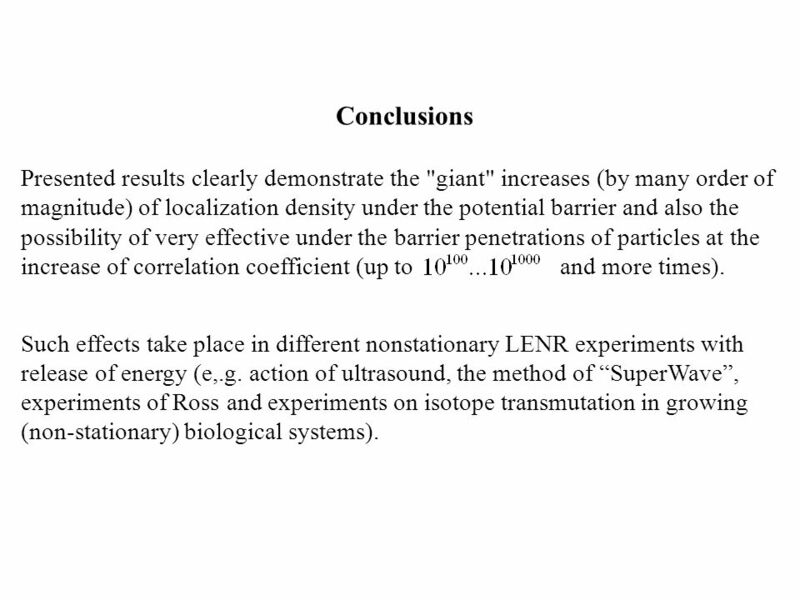 30 Conclusions Presented results clearly demonstrate the "giant" increases (by many order of magnitude) of localization density under the potential barrier and also the possibility of very effective under the barrier penetrations of particles at the increase of correlation coefficient (up to and more times). Such effects take place in different nonstationary LENR experiments with release of energy (e,.g. action of ultrasound, the method of “SuperWave”, experiments of Ross and experiments on isotope transmutation in growing (non-stationary) biological systems). 31 One more nontrivial result seems to be important. 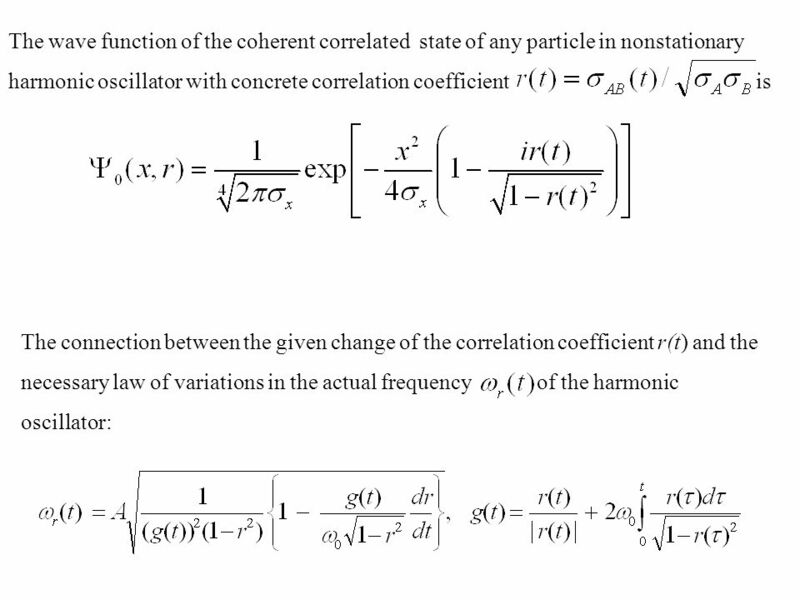 At increase of the correlation coefficient r  1 the giant increase the dispersion of the nucleus coordinate  (q) takes place. At such condition the mean square uncertainty of the of this nucleus coordinate can significantly exceed the mean distance between nuclei. 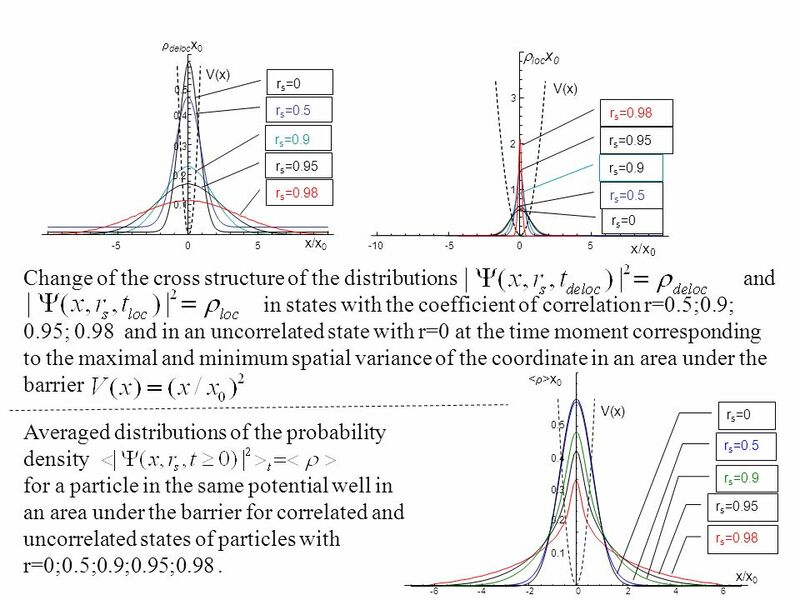 In this case, the volume of the three-dimensional region, where a nucleus in the correlated state is localized, will contain nearest nuclei, with which a nuclear reaction is possible. 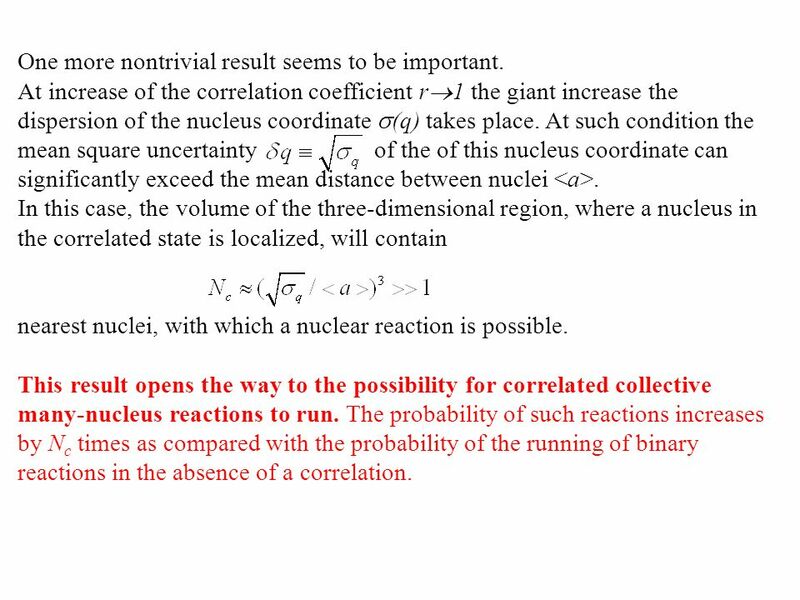 This result opens the way to the possibility for correlated collective many-nucleus reactions to run. 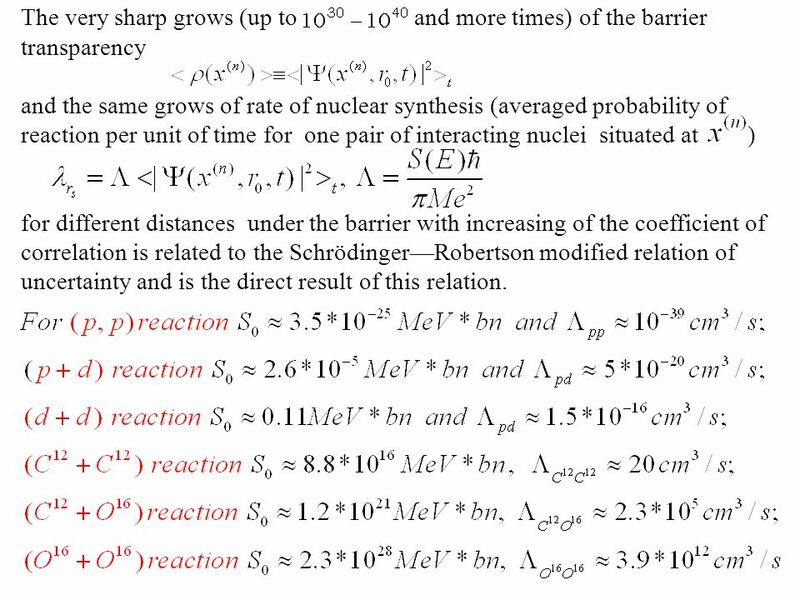 The probability of such reactions increases by N c times as compared with the probability of the running of binary reactions in the absence of a correlation. 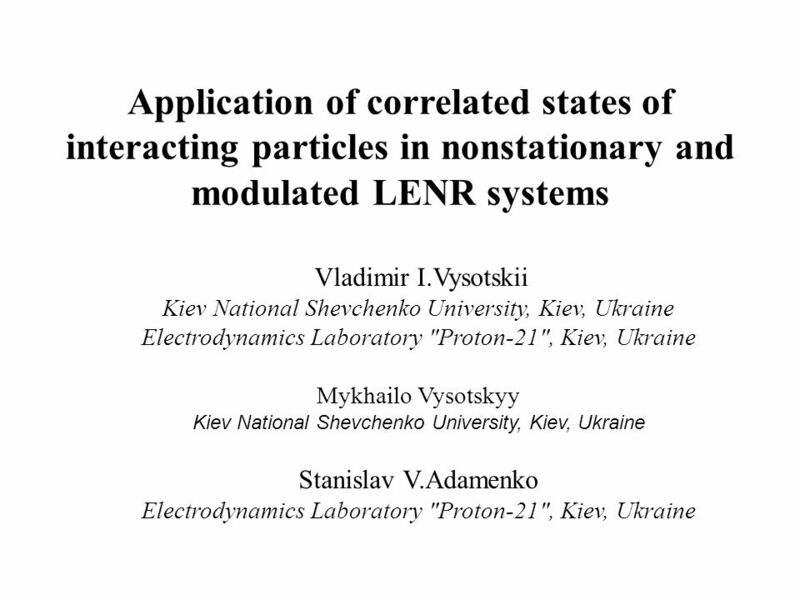 Download ppt "Application of correlated states of interacting particles in nonstationary and modulated LENR systems Vladimir I.Vysotskii Kiev National Shevchenko University,"
The Schrödinger Wave Equation 2006 Quantum MechanicsProf. 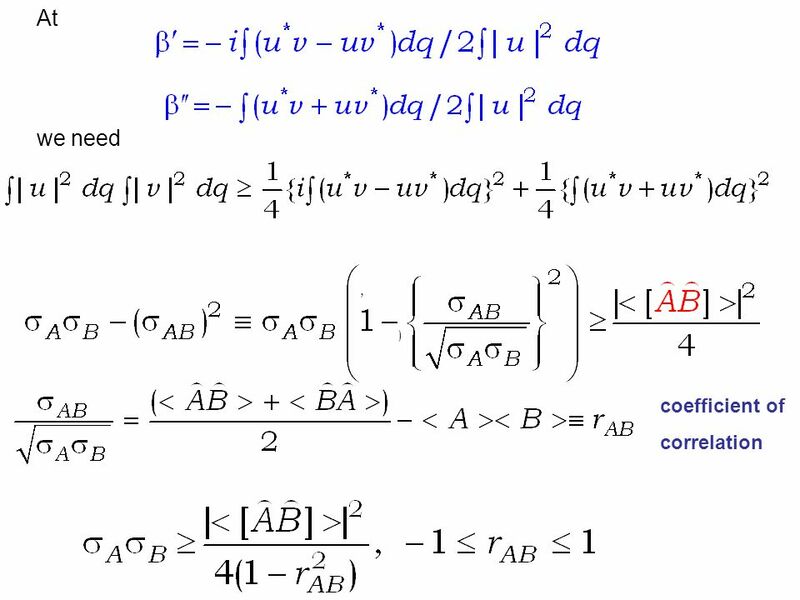 Y. F. Chen The Schrödinger Wave Equation. Vibrational Motion of Molecules. 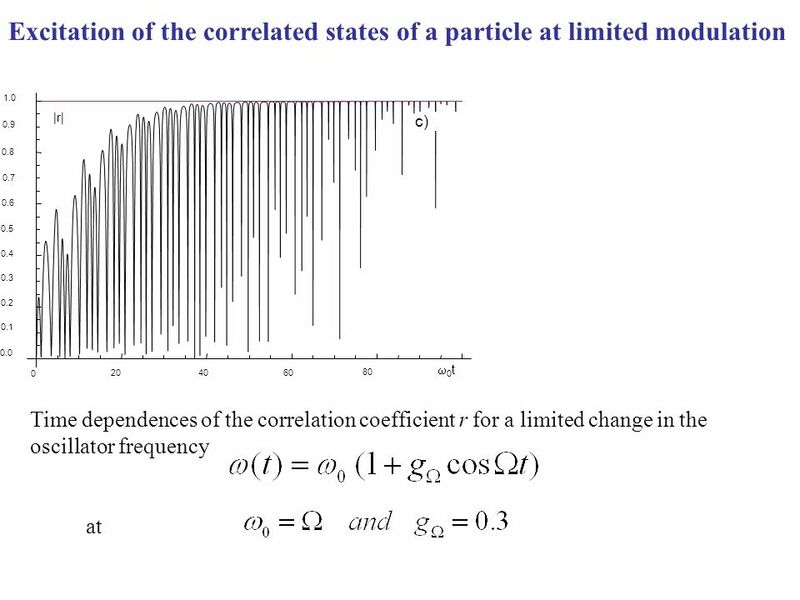 SpectroscopicPhenomena Hamiltonian PhysicalModel EigenstatesEigenvalues Dynamics Energy Construction Correspondence Testing. Energy Consumption Fossil Fuel Contribution to Global Energy Demand Year. Quantum One: Lecture 5a. 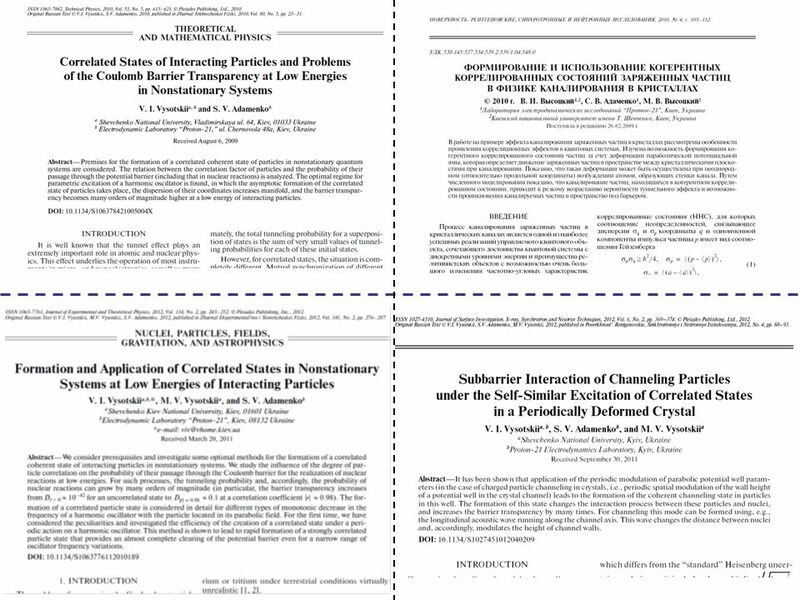 Normalization Conditions for Free Particle Eigenstates. Quantum One: Lecture 4. Schrödinger's Wave Mechanics for a Free Quantum Particle. Quantum One: Lecture 3. Implications of Schrödinger's Wave Mechanics for Conservative Systems. Microscopic time-dependent analysis of neutrons transfers at low-energy nuclear reactions with spherical and deformed nuclei V.V. Samarin. Light and Matter Tim Freegarde School of Physics & Astronomy University of Southampton Quantum electrodynamics. A 14-kg mass, attached to a massless spring whose force constant is 3,100 N/m, has an amplitude of 5 cm. Assuming the energy is quantized, find the quantum. 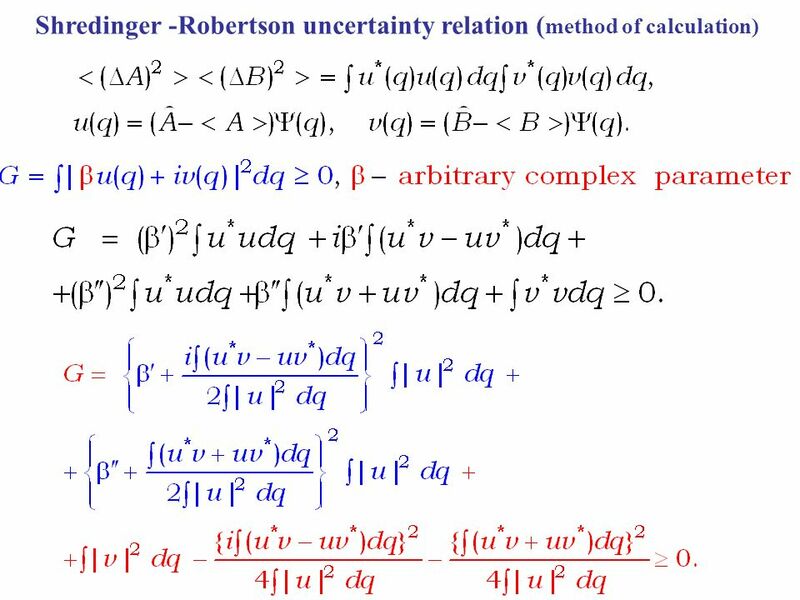 1 Chapter 40 Quantum Mechanics April 6,8 Wave functions and Schrödinger equation 40.1 Wave functions and the one-dimensional Schrödinger equation Quantum. 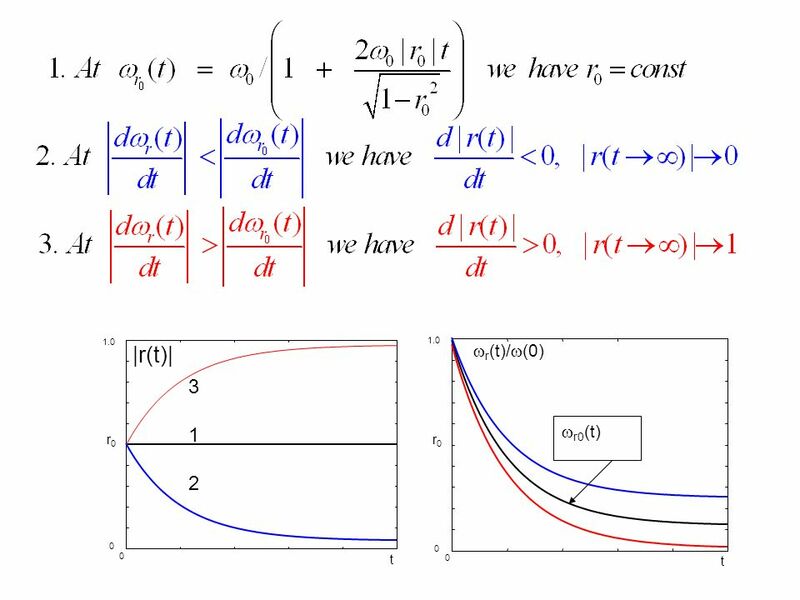 Wavefunction Quantum mechanics acknowledges the wave-particle duality of matter by supposing that, rather than traveling along a definite path, a particle. Physics 452 Quantum mechanics II Winter 2012 Karine Chesnel. Physics 452 Quantum mechanics II Winter 2011 Karine Chesnel. 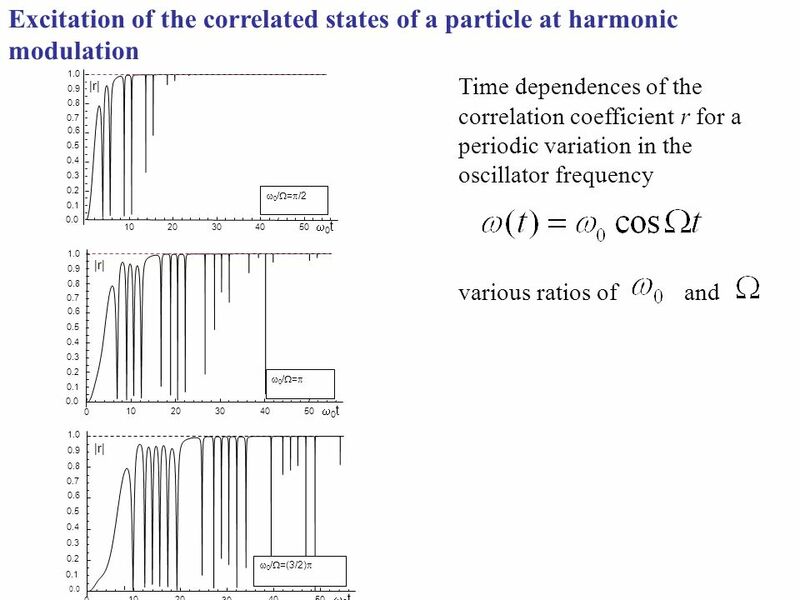 Quantum Dynamics of a Kicked Harmonic Oscillator Laura Ingalls Huntley Prof. Calvin Stubbins Franklin & Marshall College Department of Physics & Astronomy. Bound States 1. A quick review on the chapters 2 to 5. 2. Quiz 10.9. 3. 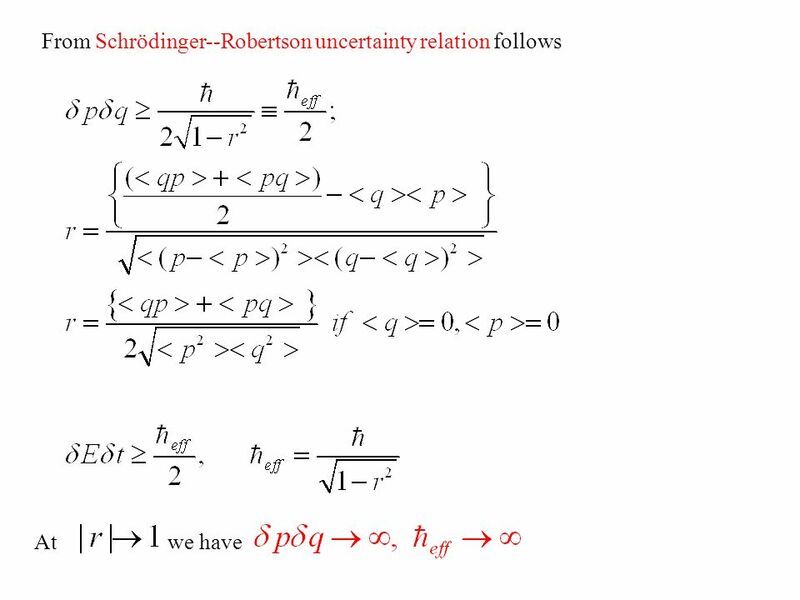 Topics in Bound States:  The Schrödinger equation. 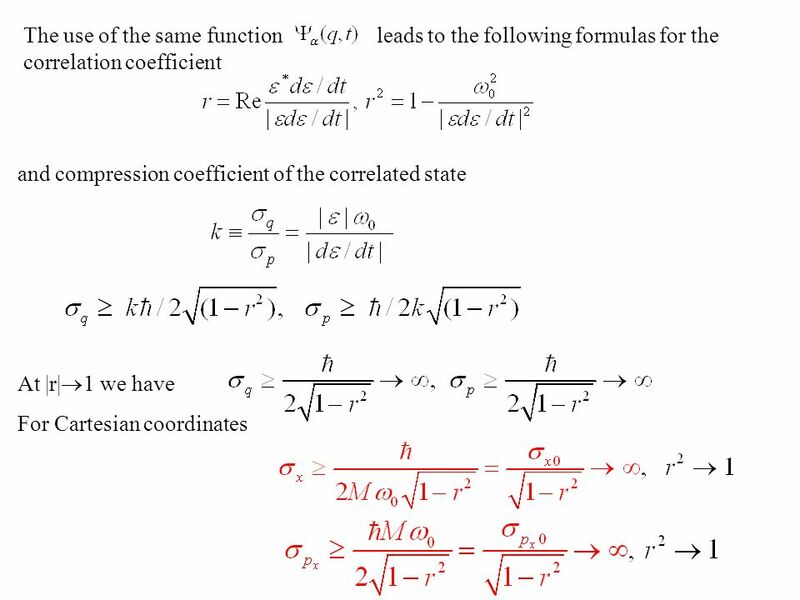  Stationary States.  Physical.